Choose Company → Planning & Budgeting → Set Up Budgets. 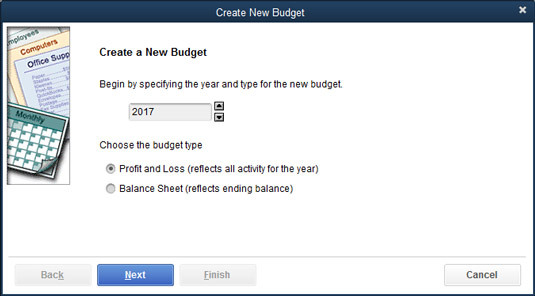 If you haven’t yet set up a budget, QuickBooks displays the Create New Budget window. If you already set up a budget, another window appears, and you need to click the Create New Budget button to get to the Create New Budget window. The Create New Budget window. Select the year that you want to budget. Use the date field to specify the fiscal year. You use the arrows at the end of the field to adjust the year number incrementally. Select the type of budget that you want to create. See those two radio buttons on the Create New Budget window? They let you tell QuickBooks whether you want to create a budget of income and expense amounts (done with a pro forma profit and loss statement) or a budget of year-end asset, liability, and owner’s equity account balances (done with a pro forma balance sheet). Typically, you want to budget income and expense amounts (Profit and Loss radio button). After you indicate for what year you want to budget and whether you want to budget income statement amounts or balance sheet amounts, click Next. Provide any additional budgeting criteria and instructions. Indicate whether you want to start from scratch; then click Finish. QuickBooks asks whether you want it to create a first cut at your budget by using last year’s numbers or whether you just want to start from scratch. To answer this question, select the option button that corresponds to your choice. For example, to budget from scratch, select the Create Budget from Scratch radio button. The Set Up Budgets window. You use the Set Up Budgets window to identify the budgeted amounts that you plan for each account. Just click the monthly amount you want to budget and enter a value. 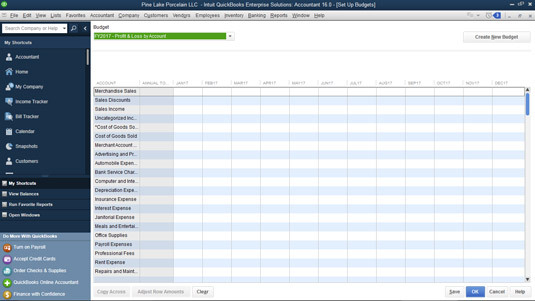 If you say that you want to budget from scratch, by the way, QuickBooks shows a window with a bunch of empty columns. If you say that you want to base the coming year’s budget on last year’s real numbers, you see numbers in the columns. If your Set Up Budgets window is too big for the monitor, QuickBooks shows only a few months of budgeted data at a time and often only some of the buttons. You should be able to click the Show Next 6 Months and Show Prev 6 Months buttons to move to the next or previous part of the budget year. You can also sometimes tweak the Windows display settings (specifically, the screen resolution) to see the full year. If you want to be a little fancier, you can also select some budgeted amount and click the Adjust Row Amounts button. QuickBooks displays the Adjust Row Amounts dialog box, which lets you adjust the selected amount by some specified percentage increase or decrease. 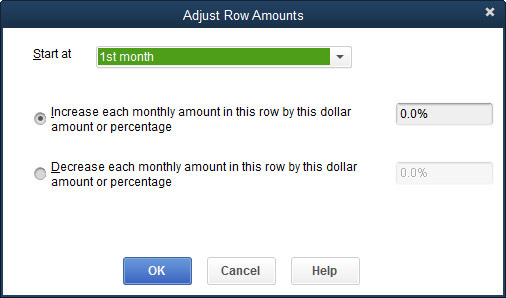 If you want to increase the budgeted amount by, say, 25% per month, you use the Adjust Row Amounts window. The Adjust Row Amounts dialog box. After you enter your Secret Plan, click Save to save your work and leave the Set Up Budgets window open. Or click OK to save your work but close the Set Up Budgets window. You can just click Cancel if you don’t want to save your work (in case you’ve just been noodling around).